[SUPER HOT SPECIAL OFFER] Audio Book Income Academy - $10,000 Per Month Selling Audiobooks! Thread: [SUPER HOT SPECIAL OFFER] Audio Book Income Academy - $10,000 Per Month Selling Audiobooks! Once 10 Spots Are Filled, Price Will Increase To $70 Each! Delivery will be by Mega folder so any updates can be delivered to you automatically. I will do my best to deliver every possible thing that is SHAREABLE meaning products that can be shared without revealing anyone's private details. Feel free to PM if you have questions. This GB also has my FULL support on this thread and ONLY for buyers. I am available through PM and Email and skype. Post your Comment on this thread OR PM me. Re: [SUPER HOT SPECIAL OFFER] Audio Book Income Academy - $10,000 Per Month Selling Audiobooks! its a must deal! you publish book for free! even giving people for free but get $5 to $15 for that free books! just a awesome GB! also first 10 people get extra sweet bonus! I'm interested. Let me know how I can get this please. Last edited by fapfapfap; 10-19-2018 at 04:38 PM. I'm in! So how do I sign up for this group buy? What needs to be done? PM ptcmail2012, I did that. I've made payment already, waiting for the course now. He is supposed to deliver today. Can you let me know if it's delivered today? I'll follow up with the payment! lightstone991Pm me for more info! i cannot PM you! Hi ptcmail2012, still waiting for the course since Saturday night. Do you have an ETA? thanks for your patience i am deliver so fast only 2 people need! i try to do it as fast as possible. thanks for your patience and understanding! 1. When I messaged you BEFORE payment, you said that it would be delivered IMMEDIATELY after payment. 2. After I paid and messaged you on Skype to get the files, you claimed that you will upload it in 1 day. 3. After that 1 day, you messaged me saying that your Group Buy rules is to send it within 3 days (72 hours). 4. Now 6 days after payment you tell me that only 2 people need. Do you, or do you not have the course? And when can we expect it? i trust them and give words based on their words! its my mistake! i knock them 4-5 times even they are not answers. i need $225 if anyone not buying with in this week i buy it or full pay for it!.. i am grateful for your patience!... i give you my total 3 top class gb ($225) completely free if it done!... its a gift for your patience... stay tuned with me dear and don't understand me wrong... love and best wishes! thank you so much. - would reimburse the $$ amount we sent you. As you understand we cannot wait indefinitely, since we assumed that the course was on your hands. There are other places where this course can be purchased from. So we need to close this story fast and as decent people. Last edited by dondavids; 10-27-2018 at 09:21 AM. Please give us a date that you will deliver the course. Thank you. I try to as fast as possible. Please allowed me a week. Also I give you 3 more awesome GB completely bonus as for your Patience. Thank you so much. Please commit to a date. Which day of which month (of this year 2018) will you deliver the course? I do not care about bonus courses, I just want THIS COURSE only. ptcmail2012's last post on this thread was 2 days ago, but last activity (as of this post) was 1 hour ago. I would like to request a follow up by the mods. I would like either the course delivered, or a full refund. I am decided to buy this course tomorrow. I just need 3 more people but unfortunately 2 people submitted paypal dispute. I am tomorrow decided to invest $280 from my own pocket. But this matter harts. So I decided to give money back who send payment! If still someone interested let me know. The gb is postponed. Thanks. @fapfapfap one question why you submit dispute?? I give refund if you simply ask! This GB has been poorly managed, and communication is very lacking. I have asked so many times for the course and I did not get a clear and definite answer on when you would deliver. Once again, please either give a refund OR deliver the course and I will close the dispute. for faster communicate! even i always give 50% lifetime discount all upcoming gb!! you need to understand we buy gb after initial spot gone! so it depends on how fast people join! so patience must be in this case! sometimes 2-3 week need to complete whole process! however i give back money all the participants based on the paypal dispute! except who wait until full spot complete! if have patience to wait pm me! i need $225 if anyone not buying with in this week i buy it or full pay for it! Note that "this week" ended on 28th when I started the dispute. I try to as fast as possible. Please allowed me a week. i have plan to tomorrow buy this course! This is why I canceled. You did not give a committed date on when you will deliver the course, and every time I ask I hear a different answer. I do not have patience to wait without knowing when to expect what I paid for. Last edited by fapfapfap; 10-30-2018 at 03:21 PM. Yes! I deducted your money! After that I need $280. I try to deliver anyway in this week most probably Thursday! You put a dispute and paypal hold money!.. You just miss opportunity 50% lifetime discount all upcoming gb! Wait I give you refund! Have a nice day! Thank you for the offer to give me a refund. May I know when you will refund? refund all buyer please check and comment here! As you can see from the screenshot, the date is 1st November, my last transaction was on 21st October. Please respond to the dispute via PayPal and get them to sort it out. Thanks. That's dated 28th October, the date I raised the dispute. It does not show that you have refunded. I am issue refund everyone!..now wait PayPal Sattle it! Have you issued the refund? There's nothing available already after a few days. Please, send a screen that you indeed issued a refund - as PayPal does not hold the funds if you issue a refund. I checked with PayPal, and they told me the same thing. Nothing received yet. your dispute is still open. 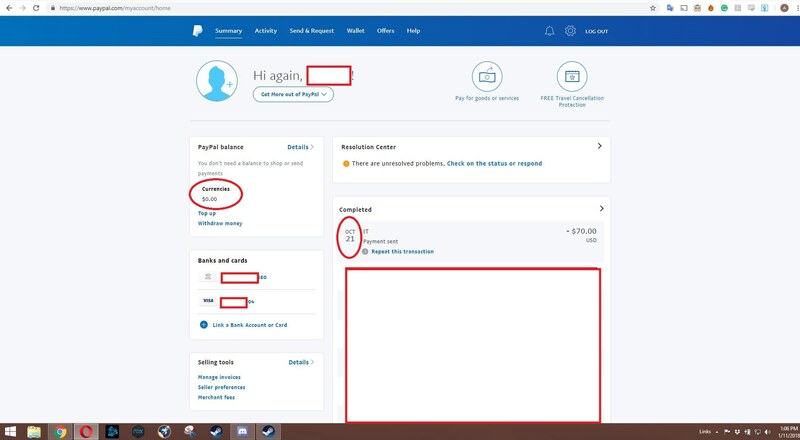 paypal send it back to you when it closed thanks. This is not correct - the dispute (at least on my side) at this stage is totally without involvement of PayPal - as PayPal proposes first to settle the refund directly with the seller. Only if you don't refund (and I'm starting to suspect you're not going to refund willingly), then PayPal recommends for their team to be involved. I have not involved them yet, as I'm waiting for final clarity from your side. Provide a screenshot that you refunded. If you don't want to do this - then I will be involving PayPal into this dispute. I was scammed by ptcmail2012. Even did a Paypal dispute and unfortunately lost. He will NEVER give updates. AND the course he gave was missing 3 modules from each. DO not Buy from him. he will not give you complete course. he is a scammer!